If you’re planning a visit to the Big Island, you may be in for a rare treat—but, only if you’re in the right place at the right time. Biologists from Cascadia Research Collective based out of Washington State has spotted a cluster of endangered false killer whales off Kawaihae, near Kona, on the Big Island, and researchers have tagged three of them in hopes of tracking their movements throughout the Hawaiian waters. They say the group moves fast—very fast—so, although it’s possible to see the animals, it would require you be in their path at just the right moment. According to Cascadia, the group is called “Cluster 2”, the rarest of the three social groups from this population. The group’s last encounter with Cluster 2 was in August 2011 and only a couple of individuals have been seen since (in May 2013, by a whale watching boat off Maui). Even researchers don’t know much about the group, and they’re still learning about the pod’s habits, but they do know that most of the sightings are off the Big Island. In fact, the group says this particular group hasn’t been seen in nearly four years. False killer whales travel in pods, such as this one. A representative from the group says the mammals move very fast, but they typically stay in the same are for an extended period of time. So, if you want to view them up-close, you may be able to spot them from a boat (such as a dolphin-watch boat or fishing boat). However, the best way to “see” where the animals are is to track the movements of the tagged individuals on the group’s Facebook page. According to the researchers, each adult is distinctive, so they compare notches, nicks, and other markings on dorsal fins to identify individuals. 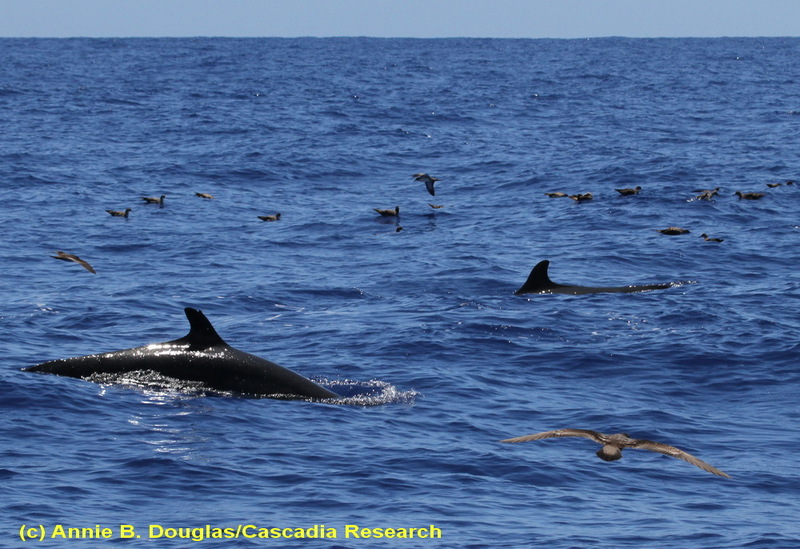 In fact, according to Cascadia, of the 20 whales photographed by the group, researchers have identified 15 individuals, including one that was first documented in 1986 and was only the 15th false killer whale identified in Hawaii waters. In total, the group saw about 50 individual animals spread over five or six miles. False killer whales usually hunt fish such as mahi-mahi. Besides the false killer whale’s endangered status, one thing that makes it unique is that the mammals pass food around from one animal to another without devouring it. According to researchers, this is the only species that has this kind of symbolic prey sharing. 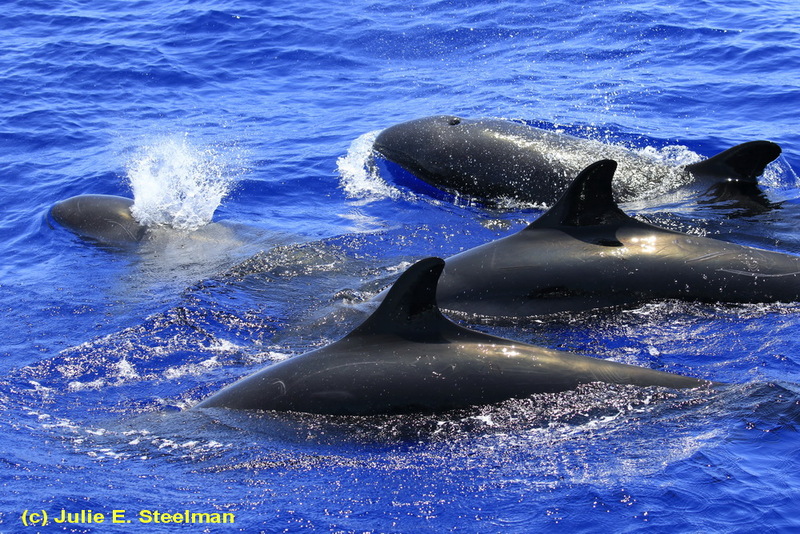 According to Cascadia, the rare Cluster 2 false killer whales they satellite tagged remain in the channel between Maui and the Big Island. So, if you’re visiting the Big Island, you may just get lucky enough to spot these endangered animals. But, like the animals themselves, you will have to move fast to catch a glimpse.